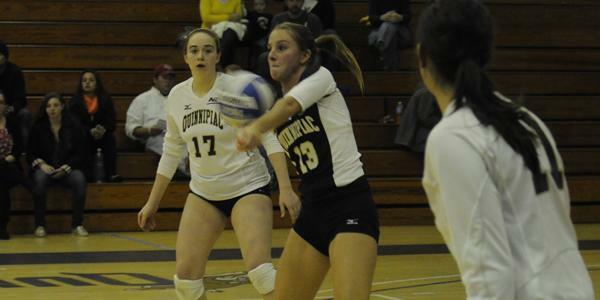 The struggles for the Quinnipiac women’s volleyball team continued Saturday afternoon on the road as the Bobcats lost in three sets (25-9, 25-20, 25-7) to Northeast Conference foe Robert Morris Colonials. The Bobcats (4-24, 3-12 NEC), who have lost five of their last six, have lost in three straight sets in three consecutive games and in four of their last five. The loss drops Quinnipiac to 1-10 on the road and Robert Morris (15-15, 10-5 NEC) improves to 7-5 at home. Tracy Wright led the Bobcats with 16 digs, while Hannah Veith led the Colonials with nine blocks and match-high 16 kills. Lindsey Monger blasted 11 kills and recorded a team-high 13 digs for the Colonials. Kayla Lawler led the Bobcats with 18 assists while also compiling three digs and two kills. Tierra Allen led the Bobcats hitters with seven kills and Brittanie Robinson and Olivia Grattan added four kills each. Robert Morris limited Quinnipiac to just 36 points for the match and has allowed just 70 points combined in its last two home matches. The Colonials were not blocked a single time in more than 100 attacks. It marked the first time the last 286 matches in which an opponent was unable to record a single block against the Colonial offense. The first set was all Colonials as the Bobcats managed one point before the RMU exploded for 12 of the next 13 points to take a commanding double-digit lead. With RMU still up by 10 points at 18-8, the Colonials basically sealed the set by winning six straight points to push their margin to 16. The Bobcats fought back in the second set and held the lead in the early going. Quinnipiac had a 10-6 lead and could not manage to put the lead away as RMU erupted for eight consecutive points, beginning a 13-2 run in which Veith contributed four kills and two blocks to give the Colonials a 19-12 lead. Quinnipiac fought back, using a 6-1 spurt to cut the RMU advantage back down to just two, 20-18 and eventually a deficit to 23-20. Sydney Sizemore and Erica Robb’s kills for the 24th and 25thpoints outdid the comeback charge. In the third set it was all Robert Morris. Halfway through the set, the Colonials had a five point advantage, and the Bobcats could not counter. The Colonials went on an striking run, claiming 15 of the final 17 points, including 10 in a row at one point, to comfortably cruise to the victory. As a team, the Colonials recorded eight blocks and 49 kills on the afternoon. The Bobcats conclude their regular season tomorrow, Sunday Nov. 13 against St. Francis (Pa.).